The fastest man in the world, who holds the world record in the 100 meters, 200 meters and the 4 by 100m relay and won gold in all of those events at Beijing 2008 and London 2012, is attempting to pull off an unprecedented 'triple triple'. If he does achieve this feat, he will cement his name as the greatest sprinter in history. The Brazilian press said that he's more popular that their soccer legends, Pele & Neymar! That the popularity of, and adoration for, this Jamaican - born in the rural district of Sherwood Content, Trelawny here in Jamaica. He is already regarded as a legend in his craft but the feeling across the track and field - and indeed the entire sporting word, is that sporting fans will be seeing something special during the next few days. He already won his heat earlier today in 10.07 seconds - just doing enough to move to the semi finals. But USA's Justin Gatlin and our own Jamaican, Yohan Blake will have other ideas. And so, the world awaits - and history bekons. So stay tuned, sit tight and hold on to something firm - this is certainly not for the weak-hearted. 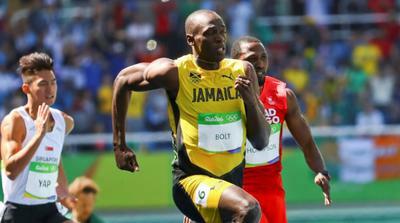 I am very proud of Usain Bolt to keep up the good work God bless I have been praying for you.